What comes on quicker than a hot flash? Monday mornings. And with that, the brain teasers are sure to follow. Sticking with the recent theme of fruit, today’s true or false format is about the versatile apricot. Although most may think fruits tree, let alone apricots may be difficult to grow, let’s test your knowledge on a few of its habits and history. Tomorrow, when you see the answers in Tuesday’s with Annie, you can make your decision whether apricots should be part of your fruit tree repertoire. 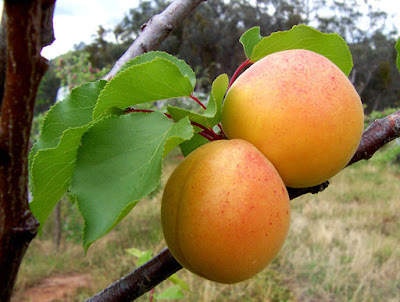 1) The apricot, Prunus armeniaca is a member of the Rose Family (Rosaceae). 2) The apricot originated in Armenia. 3) Georgia is the largest producer of apricots in the United States. 4) Apricots are one of the most drought-resistant fruit trees. 5) Apricots are an early blooming fruit tree. If you care to take Garfield’s advice for the day, “Avoid fruits and nuts: after all, you are what you eat. “ Or you can check in tomorrow and find out everything you wanted to know about apricots. Remember, you can find Annie’s Gardening Corner in a few places including Twitter. A recent addition is our new Fan Page on Facebook called ‘Bilowz Associates Inc. & Our Blog - Annie's Gardening Corner’. You can either go to the blog via our website, http://www.bilowzassociates.com/ under Blog and click on ‘Follow our Fan Page on Facebook’ or you can try this direct link to the Fan Page, http://www.facebook.com/pages/Bilowz-Associates-Inc-Our-Blog-Annies-Gardening-Corner/325316334444 for more photos, events and information including our blog.